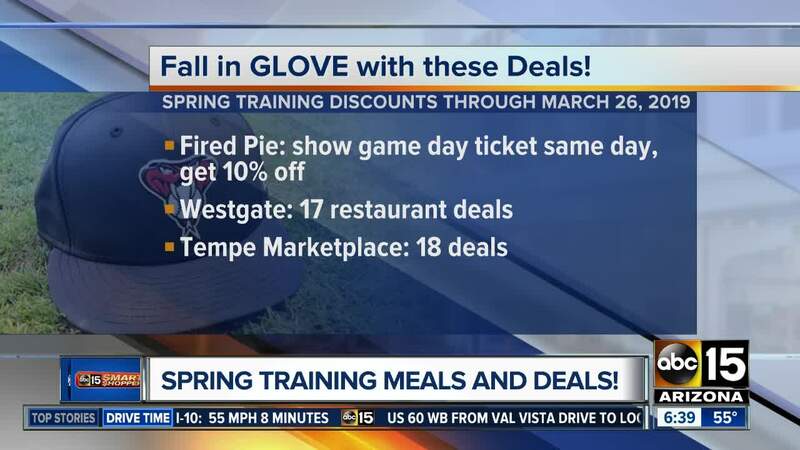 You are going to GLOVE these Spring Training deals, including fun activities and grub! 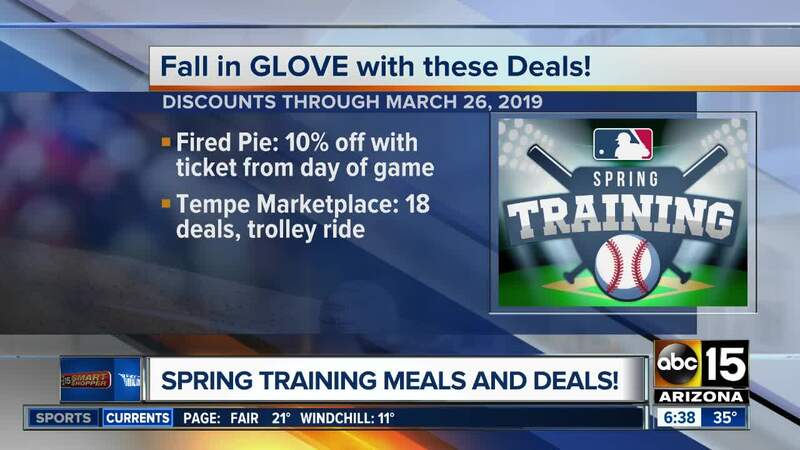 PHOENIX — Spring Training starts February 21, and restaurants and businesses want to offer you home-run deals to celebrate! Let's talk deals that last all through Spring Training. Locally-owned Fired Pie is offering 10 percent off to customers who show a valid game tickets that same day of the game. There are 19 locations. Tempe Marketplace has 18 deals, that include restaurants and other businesses for activities. They're also offering a FREE trolley ride to the Chicago Cubs Spring Training games at Sloan Park. The fine print: Offers valid for all teams/Spring Training facilities. Only valid on game day as indicated on Spring Training stub. Bar Louie, 20% off. Excludes alcohol, not valid with any other offer. California Pizza Kitchen, 20% off. Excludes alcohol and gratuity. Coffee Bean & Tea Leaf, $1 off any large iced beverage. Cold Stone, 2 for $8, Get 2 Love It Size Create Your Own (ice cream +1 mix-in) for $8. Kabuki, 15% off your check. Valid at Kabuki Glendale and Tempe with presentation of same-day Spring Training ticket stub. Dine-in only. Not valid during Happy Hour, Late Nite Happy Hour or on major holidays. Not applicable to tax and gratuity, or the purchase of alcohol, gift cards, Sushi Party Platters or the Sushi Table. Cannot be combined with other offers or rewards. One per party, per table, per visit. Ends March 26, 2019. The Keg, Complimentary Entrée with Purchase of an Entrée. Present your ticket to receive one complimentary entrée, like our classic Baseball Sirloin, with the purchase of an entrée. Complimentary entrée must be equal or lesser value than the entrée purchased. One offer valid per table, per visit at all Keg locations in Arizona. Offer expires March 31, 2019. King's Fish House, Complimentary Appetizer. Valid with minimum $25 purchase for appetizers up to $16.95. Not valid on seafood combos or platters. Limit one per table. Lucille's BBQ, $5 off $20 Purchase or More. Massage Envy, Seventh Inning Stretch: Purchase a 60-minute massage and receive a 30-minute Total Body Stretch FREE or purchase a 30-minute Total Body Stretch and receive an additional 30-minute FREE. Portillo's, Receive a free sandwich with the purchase of a sandwich, side and drink. Rocky Mountain Chocolate Factory, Free caramel apple of choice with the purchase of any other caramel apple. Not valid with any other discount or coupon. Free apple must be equal or lesser of purchase. Slices, Buy 2 slices and a drink for $6.99. Thirsty Lion, 20% off. Excludes alcohol. Valid for ticket holders only. Not valid with any other deals or offers. Yogi's Grill, Free appetizer (egg rolls or sushi) or 10% off any purchase over $10. SEA LIFE Arizona Aquarium [simon.com] [nam05.safelinks.protection.outlook.com] : Show your ticket stub at the box office and receive $5 off per ticket, now through March 31. LEGOLAND Discovery Center Arizona [simon.com] : Show your ticket stub at the box office and receive $5 off per ticket, now through March 31. Need some new MLB gear before heading to the game? Visit Arizona Mills for up to 70% off top sportswear brands like Champs Sports, Finish Line, Just Sports, Nike Clearance Store and more. Present your ticket stub to Guest Services near the Food Court and receive a Spring Training survival kit valued at $25, plus a complimentary Savings Passportfilled with hundreds of dollars in savings. Craving something other than hot dogs and Cracker Jack? Purchase $50 or more in Buffalo Wild Wings gift cards between March 18-31 and receive a $10 Visa® Simon Giftcard®. Way to knock it out of the park!